If you are looking for inspiration. look at all the different ways you can use them! Get Your Happy On Today! If you are a school and you would like to order more than 4 boxes, please get in touch. If you live outside of the UK, please get in touch to find out about additional postage costs. This will vary depending on where you are in the world and will be requested by PayPal transfer. My two daughters absolutely LOVE these! 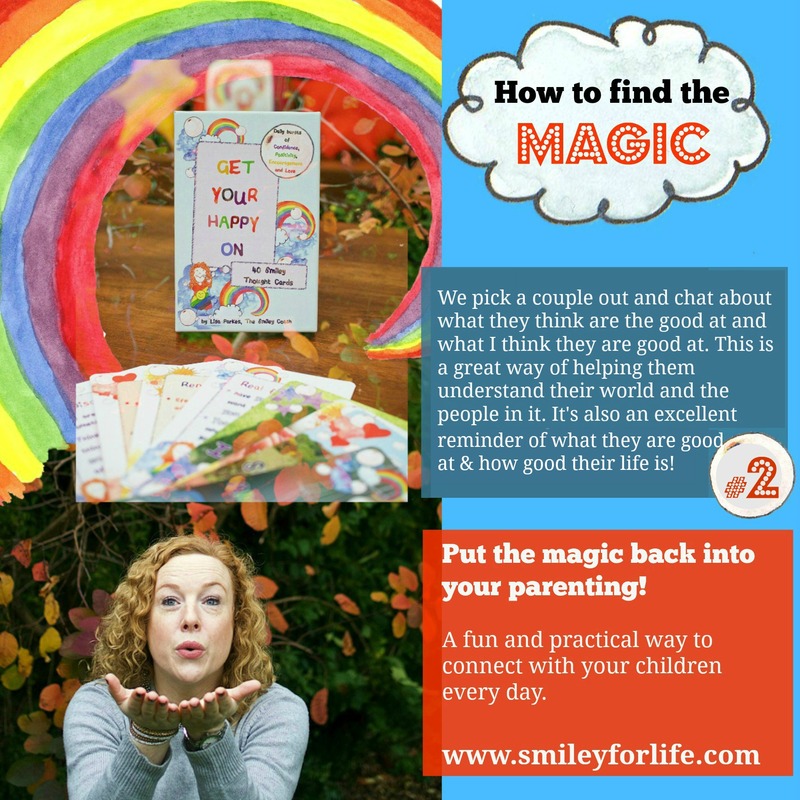 They are a great way to start and end each day – filling you and your children with positivity and confidence as well as stimulating some worthwhile conversations between you. As a family, we use the cards in different ways. My children like to look through them and pick out a few favourites for each day. This can be an interesting way for me to see what is going on in their head at any given time as they don’t always know how to vocalise their thoughts. We are already enjoying our new Smiley Thought time each day. It is a lovely way of “forcing” us to slow down during each busy day and just take a few minutes (sometimes longer) to chat and think about our feelings and our lives in a positive way. It’s really important to pay attention to your thoughts. We tend to think about what we don’t want or complain about what isn’t right. That’s human nature. 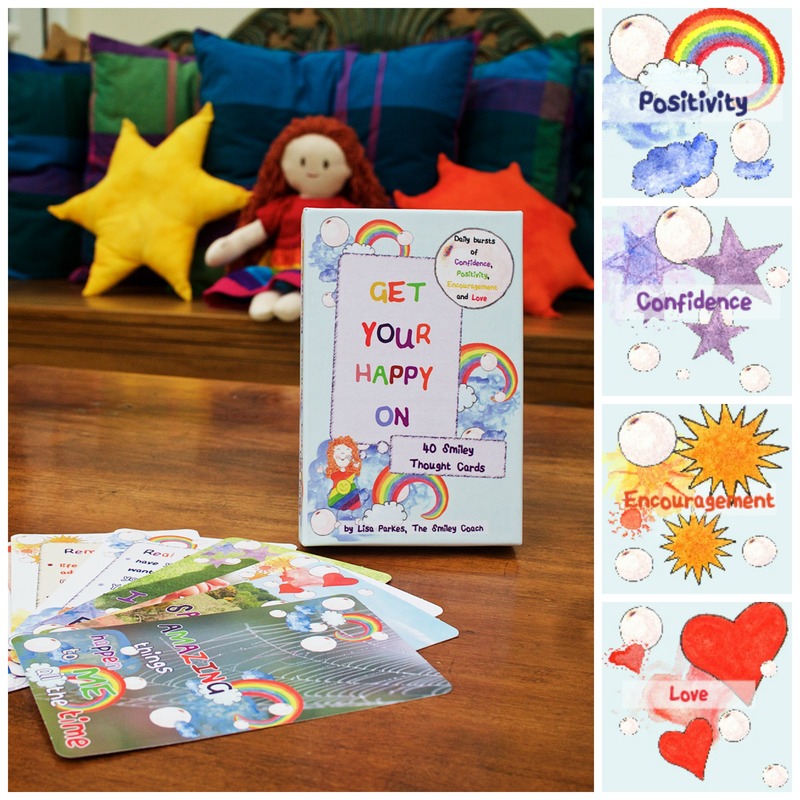 Your Smiley Thought Cards will help you start to focus on the good stuff. We are responsible for our own happiness and this box will help you flex your happiness muscle every day. It also helps if you are aware of some of the common blocks to happiness which I see in my coaching room week after week. In your deck of cards, you will find confidence, positivity, encouragement and love to lift you up when you need it. Watch these fun video clips below to see demos of the cards in action. Everybody will find their own way of using them. Listen to Smiley Thoughts Every Day for Free! 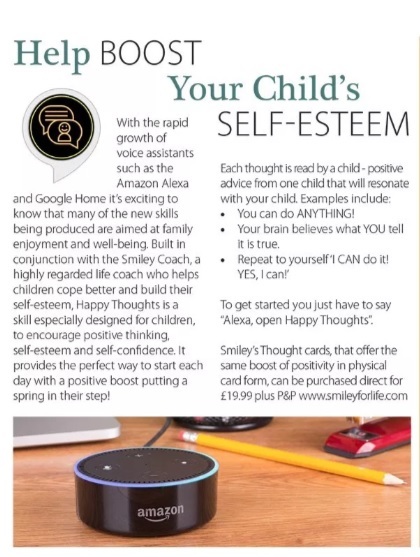 For those of you who have an Amazon Alexa, your child can now get their Smiley Thought Cards read to them for FREE, and by another child. Simply say ‘Alexa! Play Happy Thoughts!’ and see what happens. 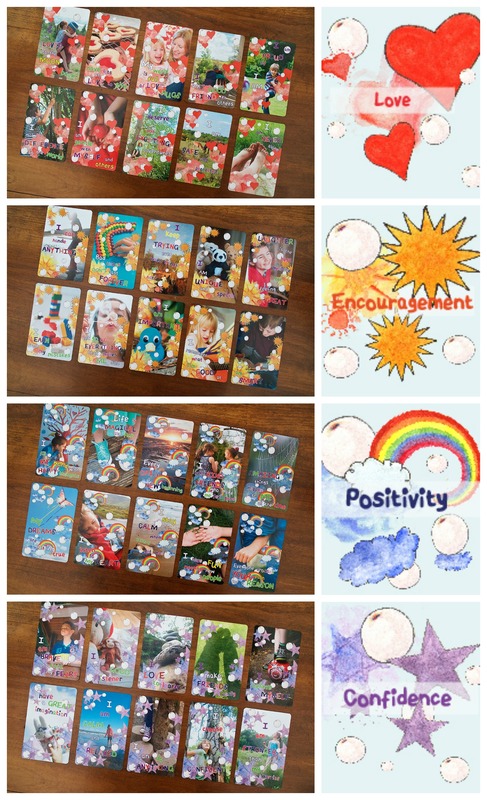 It’s a great way to infuse your child’s brain with positivity before they go to school or sleep at night. This was a joint project with ‘The Little Book Magazine’ that you can read more about here. At the end of my meeting with the school today, I whipped out my Smiley Thought Cards and told them how useful we find them for setting my children into a positive mindset for the day. The SENCo welled up reading through a few and I’ve promised to gift a set to my child’s class teacher as she said they would be wonderful to use in class! It’s the start of year 9 for us tomorrow and I wanted to drop you a line to let you know how we are getting on. Last night, my daughter wrote a list of things to remember for the morning and she stuck it on the front door. I didn’t read it until this morning, but it said: ‘Governor letter, bus money, lunch money, dance kit, HAPPY THOUGHTS!’ The last bit gave me a lump in my throat as I wanted you to know the difference you made and it’s still there a year later. Thank you!